When we walked into what was to become our home on Leestone Court in 1995, our realtor's first comment was, "Well, the kitchen needs updating." I had to agree. 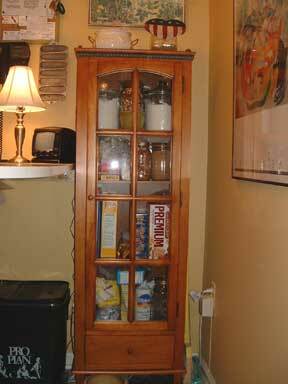 The cabinets were a dark oak with a planked door style more appropriate in a cabin or country home. The countertops were stained and scratched white Formica. The appliances were relics of another era. Hanging from the ceiling was an outdated swag light fixture, and the floor was a stained and marred vinyl. Opting to put off a major renovation to another day, we gave the kitchen a quick, slap-dash, cosmetic overhaul by painting the dark cabinets with a high-gloss white enamel, replacing the light fixture with more functional directional lighting units, and installing a breakfast bar which attached to one wall - an Ikea bargain. We laid black and white self-stick Congoleum tiles (http://www.congoleum.com/) in a checkerboard pattern. 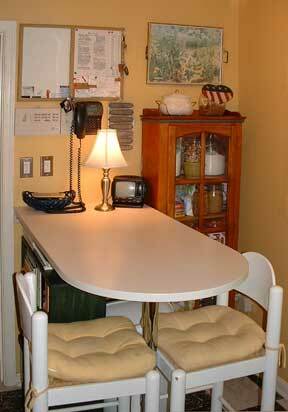 This quick makeover brightened the kitchen and provided much needed additional counter surface. A bright coat of paint and at least the room didn't embarrass us when entertaining. We then turned our attention to other portions of the house and the back garden which were craving more urgent attention. Out of necessity, over the past 7 years, we had already replaced the refrigerator, the dishwasher, the range, and had added an over-the-range built-in microwave. 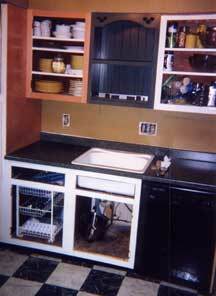 The white appliances would stay, and thus a major expense would be avoided. The cabinets were truly ugly, but the cabinet boxes themselves were solid wood, well constructed, and in the right locations. We were in need of additional pantry space and cookware storage, as well as shelves for a sizeable collection of cookbooks. There was no backsplash over the sink, and the sink was a single-bowl stainless steel model which was too shallow for heavy duty entertaining. To address these problems, we chose to keep our existing cabinet boxes and enhance their appearance with a process called "refacing." 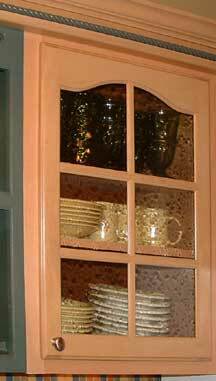 What refacing basically means is to remove the cabinet doors and hinges, apply a veneer to the current cabinets, and then install new doors. There are many refacing companies in our area that will do this work for you. 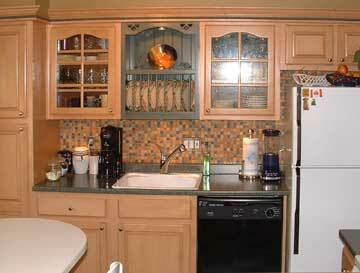 We found their quotes to be approximately half the cost of replacing the cabinets completely, but more than double the cost of doing the refacing yourself. I discovered that if one is ambitious and handy, the refacing process can definitely be a do-it-yourself project. Home Depot carries a line of refacing products manufactured by Quality Doors, a company in Texas. Their website, http://www.qualitydoors.com, includes an explanation of cabinet refacing, a description of their door and wood options, and an order form; however, the order must be placed through Home Depot or other retail home store - they will not take direct orders. For a total of about $1,600, I was able to order new, solid wood maple doors, maple veneer, finished plywood, and all the hinges and hardware necessary to accomplish the refacing project on my own. (An additional $500 went into decorative crown molding, but was a finishing touch and certainly not necessary if one is looking to save money.) The company offers a variety of door styles, finishes and stains. 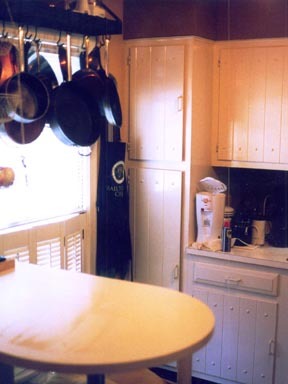 They also offer beautiful, yet "virtually indestructible" RTF (Rigid Thermal Foil) doors and drawer fronts that are the result of a laminating process that gives the look of painted wood, but with a toughness and durability paint cannot provide - perfect if you are in search of the "all white" kitchen look. Measurements must be exact for the cabinet doors to fit properly. The company's literature gives specific and detailed instructions on how these measurements are to be taken. One must be cautious and exact - what you order is what you get! After ordering through Home Depot, the doors and other supplies were shipped directly to our home and arrived in about six weeks. The process begins with the removal of all the existing doors and hardware, a process made simple with the use of a cordless electric drill fitted with a Phillips bit. The surfaces of the cabinet boxes are given a very light, manual sanding. Power sanding is discouraged. After sanding, a rubdown with a tack cloth and you're ready to apply the maple (or oak) veneer. The veneer comes in 8-foot sheets and already has the adhesive applied to the back. Measurements are made, the veneer is cut with an Exacto knife, and then carefully applied to the cabinet boxes. Once applied, it is pressed into place with a wide putty knife and trimmed with the Exacto knife. (See the picture above of the work in progress for the sink area -- one cabinet box has been veneered, the other is still white). Granted, it takes a bit of work and trial and error to get the veneer process down. 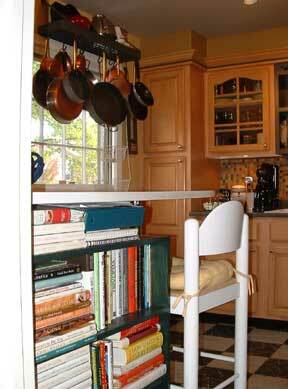 I started in a less-than-conspicuous spot in the kitchen and learned as I went along. Large sections, such as exposed cabinet ends and sides, are covered with 3/8-inch finished plywood, rather than veneer, for a more professional appearance. This is glued and nailed into place and the nails countersunk, to be filled in with putty later. Once the veneer is in place, the hidden hinges are attached to the doors into pre-bored locations, and then the doors are attached. The hinges have adjustment screws which make hanging them level and straight much easier for an amateur like me. I ordered two doors with "lites" for glass. Unfortunately, the doors do not arrive with the glass installed, so it must be ordered separately. We ordered a clear, decorative glass for the doors from Virginia Stained Glass (http://www.virginiastainedglass.com) on Port Royal Road. 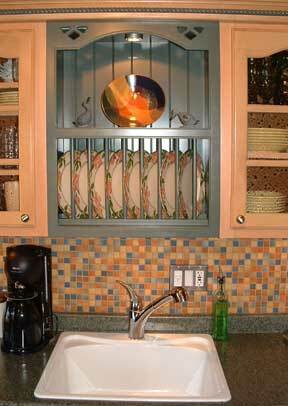 They will special order any type of glass that might interest you and best fit the design of your kitchen. Plain, clear glass, of course, can also be used and is easier to locate. In addition to refacing the cabinets, I also replaced our old countertops. A quote for replacing them with a hard surface material, such as Corian, or a natural stone, such as granite, was over $3,000 (prices range from $50 - 80 per square foot.) NOT! I was able to find attractive, post-formed Wilsonart laminate countertops at Home Depot. http://www.wilsonart.com/ These were less than $150 for the entire kitchen. 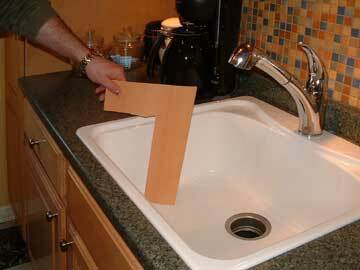 It's a simple matter to remove the old laminate countertops. They are held in place by as few as four wood screws and perhaps a few nails. Installing the new countertops is equally straightforward, but one must be careful to level them appropriately with shims of wood. (Ed: The board that Joe is holding here is part of the veneer. It was supposed to show the depth of the sink. The countertops look like granite and the small tiles in back of the sink and stove -- the backsplash -- are fabulous). I replaced our sink with a 10-inch deep MoenStone sink. (http://www.moen.com/Consumer/products/kitchen/kitchen_stone.cfm) MoenStone is a composite material made of quartz, granite, and plastics which forms a hard surface which is resistant to stains and temperatures up to 450 degrees. My main reason for selecting the white Moenstone was the fact that I was stuck with all my existing white appliances and I wanted a uniform look. I also found stainless steel sinks with the 10-inch depth that I was seeking. I looked at 2-bowl sinks, but discovered that in our Leewood kitchens we only have a 25-inch width option. The only 25-inch wide 2-bowl sinks offered two small bowls which really didn't meet the heavy duty need of a cook who likes to entertain. The planning and shopping part of this project took much longer than the actual execution. It was possible to complete the major phases of the project in four weekends. It sounds much more ambitious than it really turned out to be. Thank God for the Internet and Home Depot! Both were invaluable, and we're fortunate to have three Home Depot stores within just a few miles. (Plus Lowes is not that far!) I'm certainly not a carpenter, but merely an avid do-it-yourself'er who wanted a new look on a budget. It's given new life to an outdated kitchen and added value to our home. I would estimate that our total expenses came in under $4,500. 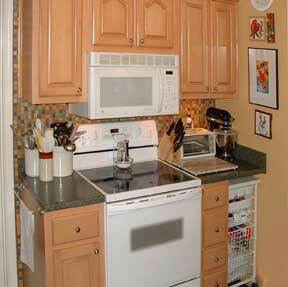 (If we had only refaced the cabinets, the costs would have been about $2,200.) It's a project than anyone who can cut a straight line or operate a power drill could accomplish with a little effort and patience. The oven area has pull out storage units where the compactor used to be.